Yahoo Appoints Marissa Mayer, A Longtime Google Exec, As CEO : The Two-Way Mayer is the fifth CEO to take the helm at the ailing company in five years. Marissa Ann Mayer gestures as she gives an interview in January of 2008. Yahoo is turning to a longtime Google executive to try to turn around the ailing company. 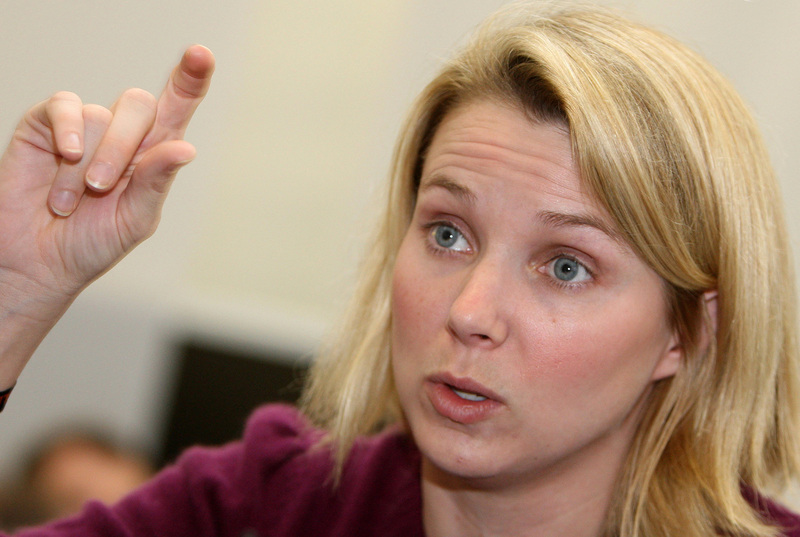 Effective tomorrow, Marissa Mayer will be Yahoo's new chief executive. She will be the fifth CEO in as many years. According to Yahoo's press release, Mayer was one of Google's first employees and most recently she was responsible for the company's local, maps and location services. Mayer's job, reports the AP, is to help the company "rebound from financial malaise and internal turmoil." "The Board of Directors unanimously agreed that Marissa's unparalleled track record in technology, design, and product execution makes her the right leader for Yahoo! at this time of enormous opportunity," Fred Amoroso, chairman of the Board of Directors, said in a statement. "Ms. Mayer, 37, had for years been responsible for the look and feel of Google's most popular products: the famously unadorned white search homepage, Gmail, Google News and Google Images. More recently, Ms. Mayer, an engineer by training whose first job at Google included computer programming, was put in charge of the company's location and local services, including Google Maps, overseeing more than 1,000 product managers. She also sat on Google's operating committee, part of a small circle of senior executives who had the ear of Google's co-founders, Larry Page and Sergey Brin. "With her appointment as the president and chief executive of Yahoo, Ms. Mayer joins a short list of women in technology companies to hold the top spot. The elite club includes Meg Whitman, the chief executive of Hewlett-Packard, and Virginia Rometty, the head of I.B.M. Another senior woman in Silicon Valley, Sheryl Sandberg, is Facebook's chief operating officer."